Don't think Sony is resting on its laurels with the Blu-ray disc: An even larger successor is already in the works. Sony announced this week that it is already making strides towards the storage system that will replace the Blu-ray disc someday. Think the 50 GB that a dual-layer Blu-ray disc can hold is a lot? How about 20 times that much? 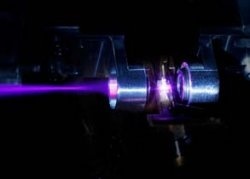 This latest successful development is an all-semiconductor laser picosecond pulse source with a laser wavelength of 405 nanometers (1 nm = one-billionth of a meter) in the blue-violet region. It is capable of generating optical pulses in the ultrafast duration of 3 picoseconds (1 picosecond = one-trillionth of a second), with ultrahigh output peak power of 100 watts and repetition frequency of 1 gigahertz. Advanced control of the newly-developed and proprietary-constructed GaN-based mode-locked semiconductor laser and semiconductor optical amplifier have enabled peak output power in excess of 100 watts to be achieved, which is more than a hundred times the world's highest output value for conventional blue-violet pulse semiconductor lasers. Blu-ray disc readers use a laser wavelength of 405 nanometers, so this new technique is sort of like that, but more powerful if I'm properly understanding this technical jargon. Sony conceivably plans to use the new laser system for the successor to the Blu-ray player. Predictions put a disc storage system using this technology at 20 times the capability of a Blu-ray disc. For example, it could allow for an entire television season to be held on a single disc. 50 GB multiplied by 20 would put next-generation disc storage at around a terabyte after all. There was no indication made as to when we'll be seeing a new disc format from Sony, but don't burn your new Blu-ray collection anytime soon. Sony wants to keep the PlayStation 3 around for at least another half decade, so I wouldn't expect this technology to be applied or viable until around when the PlayStation 4 is released anyway.